Public enemies: America's greatest crime wave and the birth of the FBI, 1933-34. · One Book. One Author. One Hour. 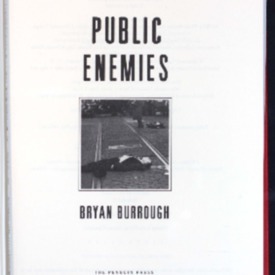 Burrough, Bryan, “Public enemies: America's greatest crime wave and the birth of the FBI, 1933-34.,” One Book. One Author. One Hour., accessed April 24, 2019, http://booknotes.gmu.edu/items/show/676. The story of the most spectacular crime wave in American history, the two-year battle between the young J. Edgar Hoover, his FBI and an assortment of criminals who became national icons: John Dillinger, Machine Gun Kelly, Bonnie and Clyde, Baby Face Nelson, Pretty Boy Floyd, and the Barkers. Author Burrough strips away the myths to reveal a web of interconnections within the vast American underworld, and shows how Hoover's G-men overcame their early fumbles to secure the FBI's rise to power.--From publisher description. "United States. Federal Bureau of Investigation--History."